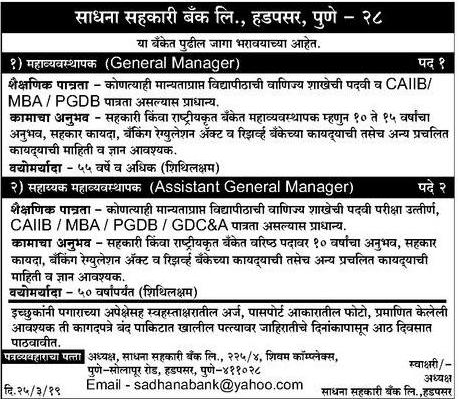 Sadhana Sahakari Bank (Sadhana Sahakari Bank Limited Pune), Pune published a new job notification for General Manager & Assistant General Manager Posts. The recruitment is for total 03 Vacancies. The willing candidates are informed to see the latest notification March 2019. Qualification required Commerce Graduate & CAIIB/ MBA/ PGDB and More. Last Date of offline application is 02-04-2019. For More details of Sadhana Sahakari Bank Recruitment 2019 Read Below. Education Qualification: Commerce Graduate & CAIIB/ MBA/ PGDB and More. For Post wise Education Details follow the detailed advertisement. Interested & Eligible candidates can send their application along with all the necessary documents and testimonials to अध्यक्ष, साधना सहकारी बँक लि., 225/ 4, शिवम कॉम्प्लेक्स, पुणे – सोलापूर रोड, हडपसर, पुणे – ४११०२८. Application starts offline 26-03-2019. Last Date of application is 02-04-2019.